Bill's OBX Beach Life: Small Yet Fun at Cape Point! Small but fun session with lots of little white water peaks on the sand bar at Cape Point Friday, April 16. Juiced 5.3m warm SW wind, and plenty of inside power while riding the Tempo92. Great setup for goiters, and lots of loops on the trip out over the bar. I was solo since the surf was small, and some of the key wave crew were out of town, plus 4WD is required for access to the spot. There were plenty of fisherman out on the Point, though none were near where I was sailing. 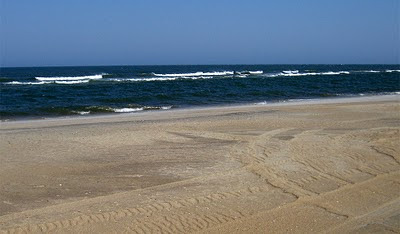 Great warm weather and water, now all we need is some Spring-time Hatteras surf?! Unfortunately for Hatteras wave sailing, popular and convenient spots such as Ego Beach, across from Canadian Hole have no working sand bars this year. Therefore, the Hatteras wavesailing scene is fairly scattered. If you are visiting and interested in hitting the Atlantic, definitely check in with Andy at Wind-NC, Olaf at Avon Sailhouse, Stu at OceanAir or Charlie at RideHatteras for the latest on where the crew is at. Also, if you have a wireless device, be sure to bookmark the OBX Beach Life Forum, as we update near real-time with wave session reports and locales on the site! Simply hiking across the dune line at Canadian Hole will not find you any waves, at least now...though hopefully, perhaps this will change later during the Spring?! small and fun in the ocean would be perfect for a pre-jam warmup! hope to see you soon at hatteras man. I'm surprised you could get to the point. What's up with the birds? Is it just that they haven't arrived yet or are things being managed differently this season? Well the closures have begun, but only in the Cove so far. Everywhere else remains open, though we will likely see closures again similar to the past few years. Luckily, at Lifeguard Beach down to Cape Point there remains decent sand bars and we can still drive out there. Though, it can get a little tight with fishing lines, but last time I was out, I had plenty of space to play! So dude, where are us travelers supposed to hit the ocean side around Avon? Is Ego beach just a big massive shore dump on big conditions? Ego has been simply a lake or shorepound. No outer sandbar. Bummer! As for those in Avon looking to hit it in the surf, your best nearby option is Lifeguard Beach in Buxton. Head south past Canadian Hole, and into Buxton. Turn left into the Cape Hatteras Lighthouse park entrance, and follow the road all the way past the lighthouse, ranger station, fish cleaning tables...until you reach a parking lot at the end of the road. That is Lifeguard Beach. Rig up, walk the rig out onto the sand and enjoy the outer bar there! If you have 4WD, you can drive out onto the sand. Its the best spot right now for outer sandbar wavesailing in SW or SSW wind direction. Even if the surf is small, it will break on the outer bars there from Lifeguard beach south to Cape Point.